If you decide to make one, I highly recommend investing in a chenille cutter. 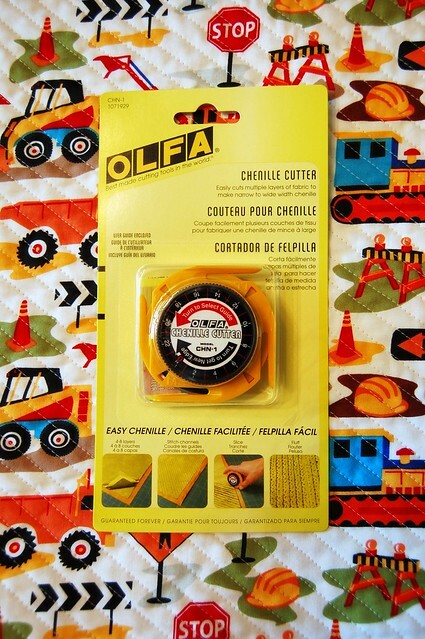 This lets you just zip right through all the cutting with no fear of accidentally going through to the cotton fabric on the front which you do NOT want to cut. And since I bought the cutter, I expect to make at least several more baby blankets to get my money’s worth out of it! 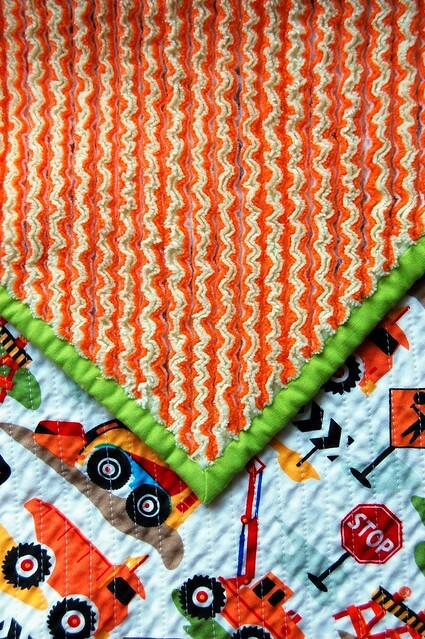 Most of the cut chenille blankets I’ve seen have rounded corners, but I love crisply bound quilt corners. I left mine sharp and bound it like a quilt. I worried about bit about hand sewing the back (chenille) side though, so I reversed my normal binding and machine sewed along the chenille side using a small stitch length. I wanted to be sure to catch as much of those little cut lines as possible. Isn’t it great how the flannel “squiggles up” and becomes chenille? 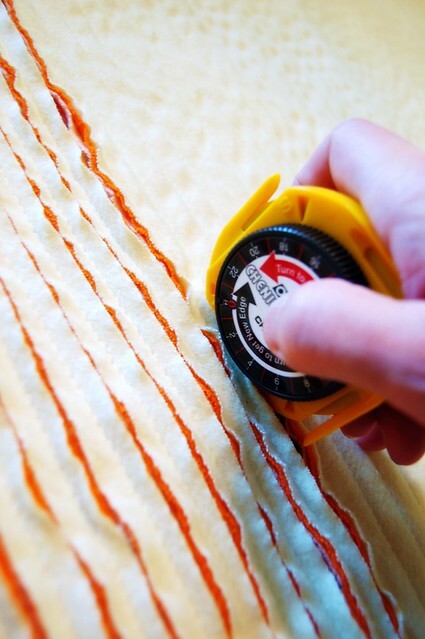 It also helps hide not-so-straight lines, another reason I think this might be a good beginner project for Alison. I’d love to make another blanket with a big, bold pattern. Sometimes fabric with a large scale print doesn’t work well for regular quilting, as cutting and piecing the smaller areas loses the overall design. This blanket would make such a feature out of a fabric like that, though. 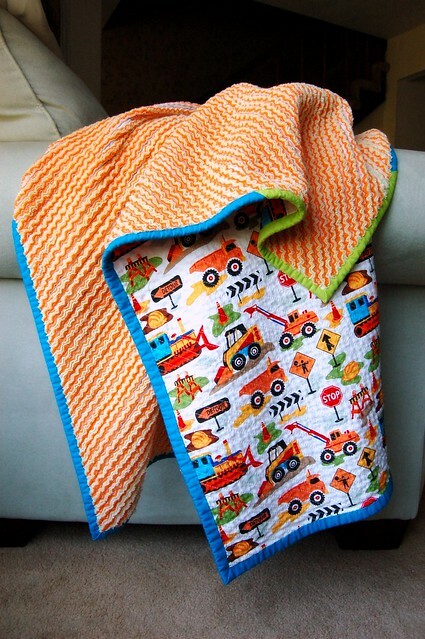 You could also create this blanket without binding. A tight zigzag stitch along the raw edges would let the ends fluff up chenille style in the wash, too. I think that could be really soft and beautiful, and certainly easier if you’ve never worked with binding. Yet another reason I love this blanket for a beginner! so cute! i’ve never seen one of these before, thanks for sharing! I love this. It just may be my first attempt. 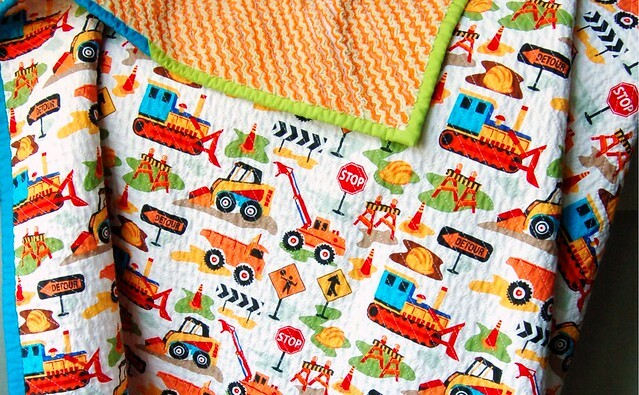 So am i understanding right…you used the cotton truck pattern, then an orange flannel, then a cream flannel? Hi Shelli! Yes, cotton trucks, then there are actually three flannels stacked together. I’m making another one right now for a baby girl, I’ll show you soon! How did you get your lines to be the same distance apart? Did you draw them on the fabric? Hi Lauren! I just followed along with the width of my walking foot as a guide, which kept the lines roughly a half and inch apart. The lines aren’t straight and they wander a bit here and there, but it’s a pretty forgiving design and the fluffy chenille helps hide that. 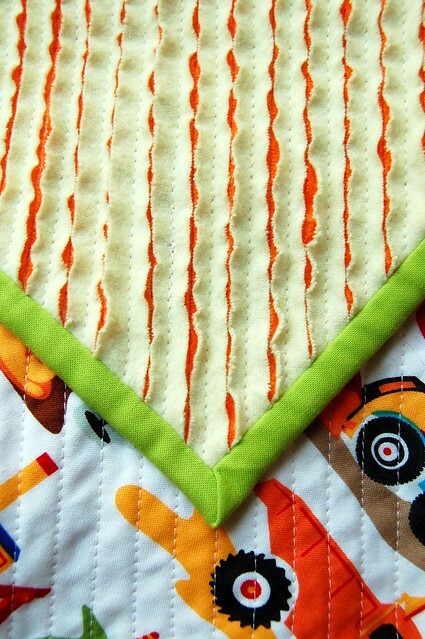 Do you bind after you sew diagonal lines and before you cut or after you cut? How many layers do you recommend? Do all of them except back stack right side up? Hi Clois! Cut first, then even up the edges and bind. Three layers of flannel are good, enough to fluff up nicely without being overly heavy. (It will be heavier than a regular quilt.) You might be able to see the layers a little better with this one: https://coopcrafts.com/2012/01/24/floral-cut-chenille-baby-blanket/ There are hot pink, purple and teal layers in that one, so you can see how much of each color flannel actually shows up as chenille. Hi Diane! I didn’t wash before — I really avoid that if I can. Cotton does shrink a little but that’s nice, it’s how you get the “crinkle” you want in a quilted item.